Joey Santley has an idea for making good use of "the biggest pile of trash that our industry makes." One Simple Thing features people who through small yet innovative ways are making a difference in education, energy, the environment, and the use of the planet's resources. San Clemente, California (CNN) -- Joey Santley's flip-flops rhythmically clap as he strolls through San Clemente's surf ghetto, a cluster of boxy surfboard-making businesses. This chatterbox entrepreneur spouts out ideas like big waves churn up foam. Surfing is a sport with a black spot on its eco-friendly soul, and Santley thinks he found a way to cleanse it. "We're going to take the biggest pile of trash that our industry makes and we are going to figure out a home for it," Santley explains. The shaping and making of surfboards for decades has produced a chemical residue, a toxic white dust that can be found all over the surf ghetto. Santley grabs a plastic bag inside the major surfboard manufacturer Lost, and points down at a pile of polyurethane powder, excess foam that sprinkled from a surfboard-shaping machine. "I'll come in here and clean up all this stuff," explains Santley, using a broom and dustpan to put the polyurethane dust into a plastic garbage bag. "They can keep cranking [producing surfboards] because it gets too full in here. "They love it because they don't have to clean up. And I love it because I come and get material for my boards. And if I wasn't doing this, the dust would be going into the landfill over the hill." Santley estimates that 40 percent or more of each surfboard blank winds up in the dump. The flaky foam waste collects and swirls like light snow throughout the surf ghetto shops. The board makers use high-pressure air hoses to blow off the itchy powder. Santley and his partner, Steve Cox, have now recycled enough foam dust to provide the raw material for 2,000 surfboards. "It saves room for tomorrow," says Mike Giancola, the director of Orange County, California, Waste & Recycling. "We're glad that they [Santley and Cox] took the initiative and found alternatives to the waste at the Prima landfill. That's the kind of sustainability we like to see." Surfboards are made from blanks -- board-shaped foam cutouts that are finished at manufacturers such as Lost, where legendary shapers such as Matt "Mayhem" Biolos sculpt the final product. Biolos says the average cost of a surfboard is $650 and each board is custom made to the buyer's specifications in flexibility, length, width, thickness and more, down to 1/16 of an inch. "There is really no other example of it in the sporting world, so we are really spoiled about our equipment," says Biolos. "We can go and get them made in almost any surfing country in the world, to fit our exact specs. It's not like buying a tennis racket or a baseball glove with another athlete's name on it." So the question hanging ten out there is: Will surfers with spiritual connections to their beloved custom-made boards be willing to ride on recycled material? Professional superstar Cory Lopez says among the many boards he rides are some of Biolos' Lost boards, crafted from Green Foam Blanks. "Green foam, it works just the same as the other boards but it's just a little more environmentally friendly," Lopez told CNN. "So it's a win-win situation. You have to enjoy the fact that it is good for the environment and the fact that you can go out there and ride it just the same as any other board." The earliest generation of Green Foam Blanks suffered from a slight flaw that does not affect the ride, but could turn off surfers with their notoriously picky tastes. The surfboards made from recycled foam blanks were dotted with little specs, giving the boards just a slightly dirty or murky finish. But the buzz in San Clemente's surf businesses is newest batches of Green Foam Blanks are less murky and Santley showed off some visibly cleaner next-generation boards. But surfers are the last people who should worry about looks, Santley says. "I don't know many surfers that wear lipstick and makeup when they surf," he says. "I don't wear lipstick and make up, so what does it matter what it looks like if it [the surfboard] is light and strong and has the right flex and does the job under your feet?" Green Foam Blanks may have never gone from one of Santley's ideas into the water, if not for a major shake-up in what the Surf Industry Manufacturing Association calls a $190-million-a-year business (about 300,000 surfboards). The dominant supplier of surfboard blanks, Clark Foam, shut down in 2006, opening the market to new firms, including one created by some of its former employees, U.S. Blanks. 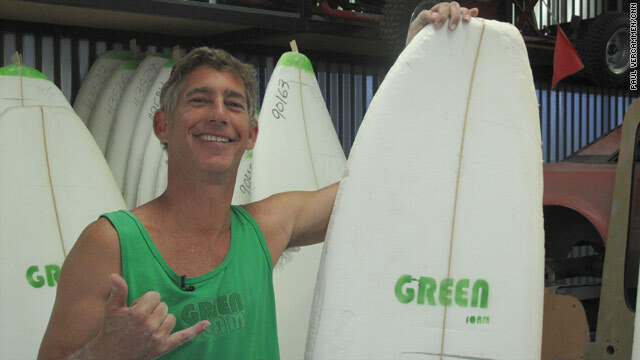 Santley saw an opportunity to "green up" surfing by recycling all that blanks' dust and is now teamed with U.S. blanks. "Everyone kept saying, 'Don't waste your time, don't waste your time,'" Santley recalls. "Finally we got the opportunity to, and a blank manufacturer to do a test. After 50 years of rigid polyurethane production on Earth, we successfully proved our concept in one hour." Pre- or post-consumer recycled content?